Desfrute deste belo condomínio de frente para o mar diretamente com vista para a praia HDTV Wi-Fi extra grande varanda com vista para o mar e calçadão, acomoda 11, sem aluguéis para grupos sênior (escola) ou qualquer grupo com menos de 25. GRANDE VARANDA PROLONGADA COM VISTA PARA O PASSEIO DE BORDO, FAZER ISSO UMA BUSCA APÓS O LOCAL! Junte-se a mais de 3 milhões de pessoas que irão desfrutar de Ocean City Maryland este ano! Excelentes características deste condomínio: Este espaçoso 1785 sf. condomínio tem novo proprietário que colocou em todos os móveis novos, eletrônica, com grandes TVs de LCD HD totalmente mobiliados em cada quarto. Principal espaço de vida tem HBO e acesso a Netflix Amazon Movies, leitor de DVD Blue Ray. Este é um belo edifício novo no centro da cidade com espaço de garagem fechado privado garantido na rua. Belmont Towers é um destino procurado em Ocean City! Apresenta excelente localização ao lado de tudo o que torna o OC ótimo! Segurança nocturna, amplo terraço com área de piscina. Condomínio oferece 9 'tectos, ampla sala de estar, cozinha moderna grande, quarto principal grande e 3 banheiros espaçosos para fazer uma experiência de férias descontraído fácil vai! Luxo apresenta abundância! A cozinha gourmet oferece forno de convecção, geladeira grande com congelador de largura total. Totalmente equipado com cafeteira, Keurig, Waffle / sanduicheira, liquidificador, torradeira e talheres. Novo mobiliário 2016. Colchões muito confortáveis, oferecendo uma ótima noite de sono. A despensa tem lavadora e secadora de tamanho completo. A varanda espaçosa de grandes dimensões oferece uma vista fantástica sobre o Oceano Atlântico, o calçadão OC para observar as pessoas! Suíte Master enorme: A suíte master oferece um santuário para ficar longe de tudo! Possui um banheiro principal de cerâmica com banheira de hidromassagem e chuveiro separado. pia dupla vaidade. Equipado com um secador de cabelo. Quarto principal tem cama king size set com 48 "HD TV / DVD, Três grandes janelas panorâmicas oferecem vistas deslumbrantes sobre o Oceano. Há duas cadeiras giratórias de couro e sofá para permitir que você veja o oceano, jogar cartas, ler ou apenas girar em torno de ver a TV. Porta de correr privada acesso à varanda e vista para o calçadão, mar e cais de diversões. Ótimo lugar para se aposentar e relaxar das atividades do dia! Downtown Location: Um dos maiores problemas com o calçadão OC é o estacionamento! Resolvido com a garagem privada! Você pode estacionar seu carro e caminhar para tudo o que você pode querer fazer. Todas as lojas, diversões, bares, restaurantes estão a uma curta distância a pé. Dentro de 5 blocos são aluguel de jet ski, barcos de pesca de alto mar, mais de uma dúzia de restaurantes, mini-golfe, a praia, o cais de diversões com passeios para todas as idades, arcadas de vídeo, sorvetes, doces e lojas de camisa, batatas Thrashers, Pipoca de pescadores. Tudo bem na sua porta. Melhores supermercados estão do outro lado da ponte, mas menos de 2 quilômetros de distância. Este condomínio vende todos os verões Não espere! faça sua reserva cedo para que você não fique de fora! Sistema de som surround fornecida na sala de visitas com a Samsung 1080p 47 'TV, BluRay com a Netflix Transmissão Filmes e caixa de cabo HD com serviço a cabo HBO. Serviço de cabo inclui Xfinity On Demand filmes e shows que podem ser vistos a qualquer momento. Cada quarto tem uma TV HD tela plana de LCD com leitor de DVD Entretenimento embalado inclui canais em HD, filmes streaming Netflix estão incluídas na sala de estar através do leitor de BluRay Cozinha tem conjunto completo de aparelhos pratos, ajustes da tabela para 11. KitchenAid aparelhos high end. We had a short stay but enjoyed every minute of it. The condo was perfect for our family. We had 8 adults and two children. Plenty of room for everyone, beautifully decorated and the outdoor area was the best (especially for people watching). Thanks so much for sharing your home! Loved the place. The views were great. Made some great memories. Great location, beautiful decor, comfy beds, spectacular views.. had a great winter vacation! Owners and management are great to work with! This was my third time as their guest and I️ hope to stay again next year! Location location location, but pack a mop. This condo is at the absolute Times Square of OCMD boardwalk locations. Directly on the boards with access to a huge beach and a block to the pier. The unit is tastefully decorated with well made furnishings and the kitchen has every gadget imaginable. The unit really needs to be cleaned though. From the surface it looks fine, but the floors are for a lack of better words absolutely gross. Everyones feet were immediately black and all the socks that were worn were thrown out. For the amount of the rental, the owners should have the unit deep cleaned and the carpets shampooed. Yes, it is at the beach and we did not expect pristine conditions, but this was over the top. We went out and purchased a mop and did the hard surfaced floors ourselves, but the rugs are just as dirty. The prior renters also left dirty undergarmets in dresser drawers and on the huge balcony that the cleaners did not remove, plus multiple empty bottles under the beds in the bunk room again confirming just a surface cleaning. One of the sliders was rusted shut and could not be used and there were numerous lightbulbs that need to be replaced. This unit is at the action spots on the boards and directly over food establishments so plan on quite a bit of noise. We expected it so it was not a big deal. We wanted the convenience and oceanfront location. Monday and Tuesday fireworks directly outside the unit were awesome along with the nightly light show. One night was a bit warm and humid, so being able to watch from inside was appreciated. Garage parking is an awesome convenience with added security. Overall, a great stay and an awesome time had. Would I recommend staying, yes.....but bring dark colored socks and a mop. Would I return? very debatable. The owners did an 8 day rental from Monday through Tuesday so we had no traffic issues coming into or leaving the city which made for a lot more of a relaxed time. I will be looking for a similiar arangement next year and I would return for this convenience alone. I hope the owners react to the feedback, as it really is a great place. We appreciate our guests providing feedback about their stays in our units. It helps us know how to focus our efforts to improve our guests experience. We have been getting email inquiries about this review and want to respond about the cleanliness of the condo. We use a cleaning company who cleans over 200 condos in Ocean City and generally does a very good job. There are occasions with rapid turnovers, with 2 or sometimes 3 check-ins per week where something can get missed. While we strive for this not to happen, we are all human at the end of the day. We do ask that our guests contact either us or the cleaning company about issues so that we can address issues with the condo. In regard to this review, the main issue is the black soot that gets ground into the tile floors and carpets in many OC condos. This issue is very hard to fully address short of literally power washing the floors with a special device. It is created by people walking barefoot or with flip flops picking up asphalt dust and soot from the ally and boardwalk as well as from the garage floor which gets black from the car exhaust. They then come into the condo and grind that soot/dust into the tile with hundreds of pounds of pressure per sq inch. We do double mop the floors between guests and shampoo the carpets monthly, but a mop has nowhere near the pleasure necessary to remove the particles from the crevices in the tile. When you then walk on the tile with wet bare feet after a shower, your feet will pick up the black soot that was ground into the tile. We are really wrestling with this phenomenon and the best way to address it. We have tried numerous detergents, mops, Swiffer’s with no real solution simple solution. We do power wash the tile 2x per year but there is just not enough time to do it in every unit between every guest’s stay. If you ask any property manager in Ocean City about the black feet issue, if they are honest, they will tell you it is a tough problem still looking for a solution! It gets especially hard in late August when the last review was written, as it is at the end of a long summer dirty feet grinding in the dust, with limited time to get into the units to do the deep clean they need. We continue to work toward a better solution, but be assured it is not from lack of effort. Spacious accommodation with everything a family needs on vacation. Cleanliness is subpar. Very nice unit with many amenities. 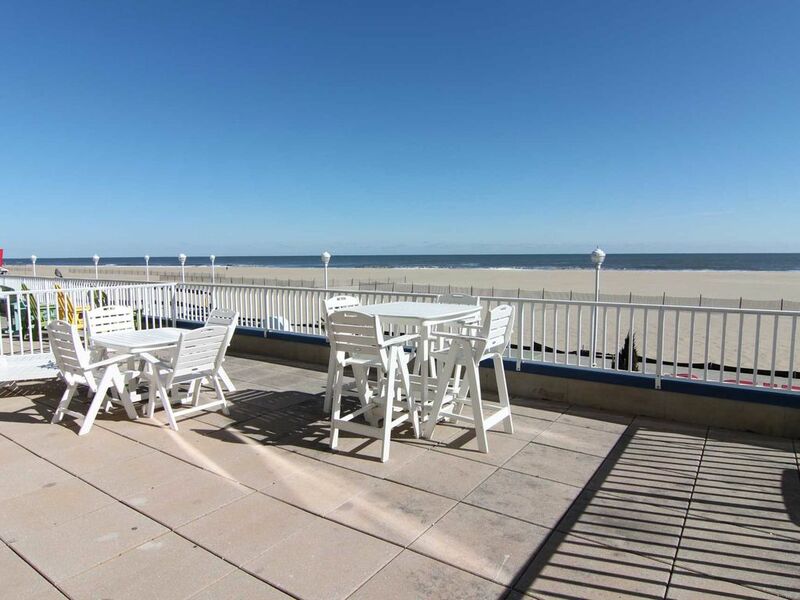 Beautifully decorated and a perfect location on the beach and boardwalk. This is our third vacation at Belmont Towers and our only complaint is the cleanliness of the units and property grounds. Please see response to the last review about cleanliness. We are continually working to keep this unit very clean! Location is great. Large porch great, would have like a few more of the high chairs, just two there. Furnishings were comfortable, except for kitchen chairs/bench. They were really uncomfortable and in somewhat loose, or sagging condition. Owners addressed a couple of very minor issues very quickly, and responded great. I look forward to staying here again. O local perfeito para se divertir! A praia é a mais larga da cidade, com muito espaço para seu guarda-chuva, cadeiras e toalhas. Redes de vôlei estão diretamente em frente do edifício para amantes dos esportes. Peixe fora da Route 50 ponte 3 quarteirões de distância. Exercite-se no centro de fitness, relaxar na sauna ou passear na praia e calçadão. Cabeça até o parque de diversões Jolly Roger 4 milhas de distância. Andar de bicicleta no calçadão antes das 10h e contemplar a vista à beira-mar. Caminhar no calçadão a um restaurante ou bar favorito. Faça um passeio até as lojas de Delaware para o imposto sobre vendas compras livres. Dirija para o parque nacional na ilha de Assateague, ver os cavalos selvagens e praias bem abertos. Passe uma manhã alugar um cavaleiro da onda no lado da baía, ir para-vela caminhada a 2 quadras da doca onde os grandes barcos de pesca em torno de 16:00. Veja a captura de grandes atuns, marlin. Tanta coisa para fazer e tão pouco tempo!